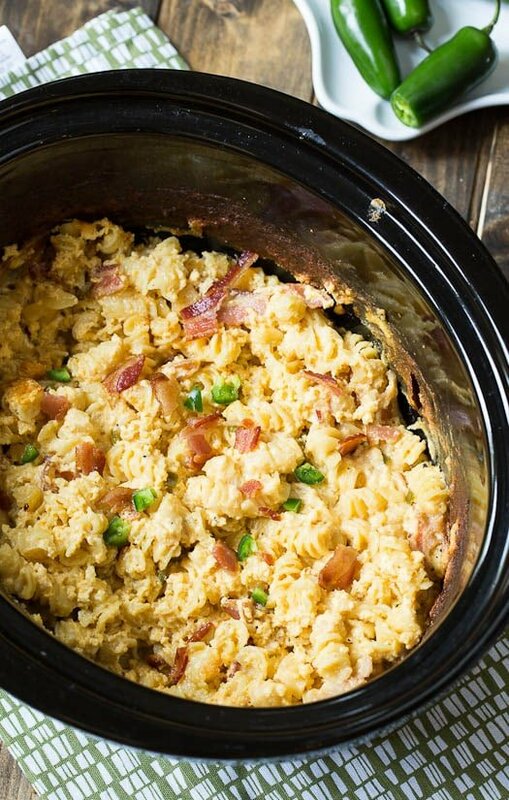 Creamy, cheesy macaroni made in the slow cooker with bits of salty, smoky bacon flavor. It’s the ultimate comfort food and so easy to make. No need to cook the pasta first. How awesome is that? I had never made mac and cheese in a slow cooker before I tried Trisha Yearwood’s Slow Cooker Mac and Cheese. I liked it so much I’ve been playing around with other crockpot mac and cheese recipes. And the only way mac and cheese gets better is with bacon right? I actually added jalapeno too to jazz it up even more but the jalapeno is totally optional. I find it’s best to cook the bacon first. Otherwise it will have an unappealing texture and color. 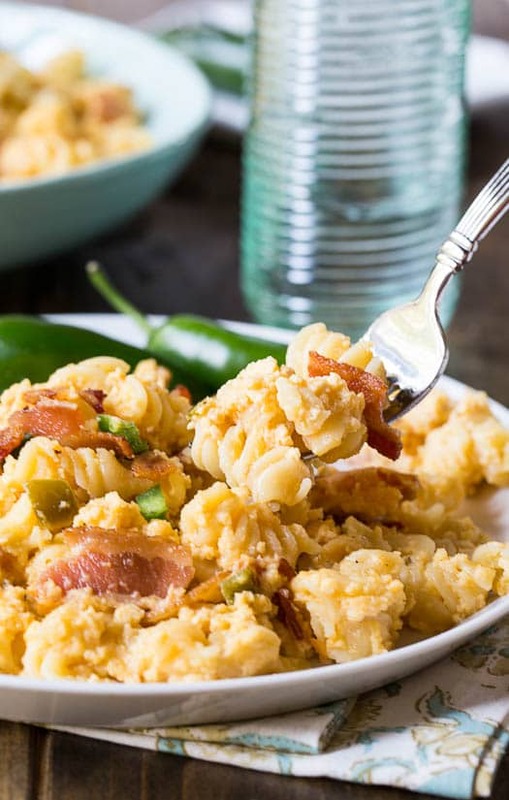 It does lose its crispiness if you put it in the crockpot to cook with the macaroni, but it really helps get that bacon flavor we all love so much into the mac and cheese. Alternately you could just reserve the bacon and sprinkle it on top of the cooked macaroni. I sautéed some diced jalapeno just briefly in the bacon fat and then added it to the crockpot along with uncooked fusilli, cheddar and monterey jack cheese, 2 eggs, whole milk, evaporated milk, a little butter, Worcestershire sauce, salt, pepper, and garlic powder. I turned the heat to HIGH for 30 minutes and then to LOW for 2 1/2 hours. I find that if you keep it at HIGH too long, it burns around the edges. But cooking it on HIGH for a little while really helps shorten the cooking time. At the end of the cooking time, the pasta is cooked just right and it has absorbed most of the liquid creating a thick, rich macaroni and cheese. 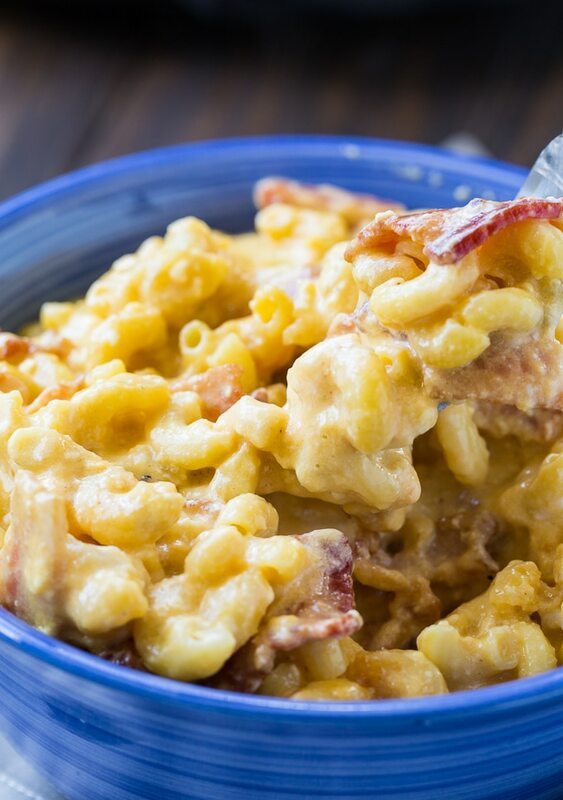 There's no better comfort food than Slow Cooker Bacon Mac and Cheese. 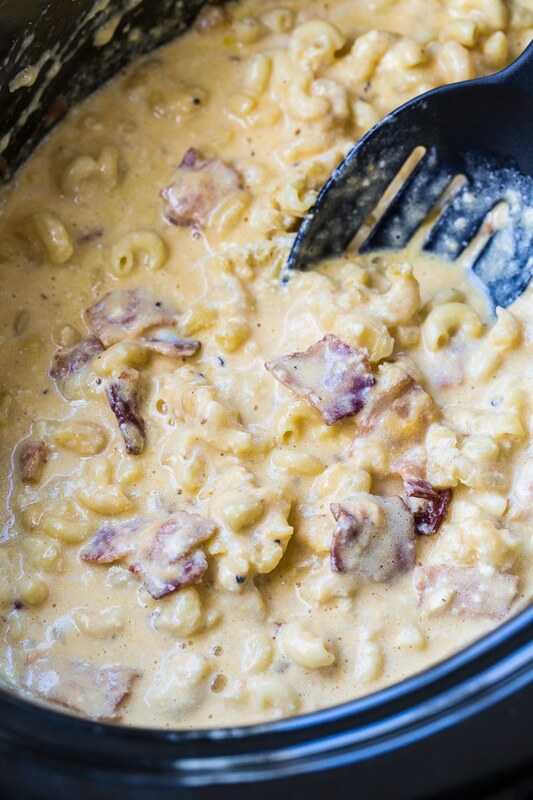 It's creamy and cheesy with tons of salty, smoky bacon flavor. Cook bacon in a nonstick skillet. Place on paper towel-lined plate to cool and then crumble the bacon. Discard all but 1 tablespoon bacon fat. Saute jalapeno in bacon fat until soft. Remove from heat. Spray a crockpot with cooking spray. (My crockpot is about 6 quarts.) Use a slotted spoon to remove jalapenos from skillet and place in crockpot. Combine all remaining ingredients, including bacon in crockpot and stir well. Reduce heat to low and continue to cook for 2 1/2 hours. If you love Mac & Cheese, this Creamy Mac & Cheese is a must try! This entry was posted in Main Dishes, Slow Cooker and tagged bacon, cheese, Crockpot, mac and cheese, slow cooker. Bookmark the permalink. Have you doubled this recipe in the crockpot? Will it take longer to cook if I double it? I made this today for my Thanksgiving pot luck at work. It turned out amazing. Not only was it the first dish to empty, but everyone was asking for the recipe, and asking that I make a double batch next time! I love crock pot dishes for work luncheons because they can cook on my desk and be served hot! Thanks so much for this recipe. I made this tonight–very simple to assemble and very tasty! Skipped the jalapeno (afraid it’d be too spicy for the kids), but I put in some finely diced white onion instead and then sprinkled individual servings w/ chopped scallions. It was a hit with all 4 of us! Thank you for the recipe. Go glad you enjoyed it and thanks for leaving the feedback! I made this recipe just a couple of days ago! In the future, I’ll be sure to add more noodles. I enjoyed it a lot, except that I prefer a creamier texture. The dish turned out a little bit goopy… and it was not good when reheated. I consider myself a massive Mac and Cheese lover.. but even I have never made Mac and Cheese in a slow cooker before. Thanks for the idea, I definitely will be trying the recipe out. I am loving this Christin! I especially love the addition of the jalapeno (which you know I’m a huge fan of!). And the tip about the bacon is a great one ~ so thanks for that! Pinned! I love homemade mac and cheese and the fact that you made this in the crockpot is fantastic! I love the bacon in this too, bacon makes everything better. Pinning this one! Wow, this looks completely amazing!! I love the bacon and jalapenos together! I’m not a little in love with this – I’m VERY in love with them! Totally pinning to add to my Fall menu! Now this is something that needs to happen soon! Mac and cheese is a favorite of ours, and this sounds beyond easy to make. And bacon makes everything better! Yum, bacon and mac and cheese sound so delicious! I love the idea of making this in a slow cooker. Our week is so busy more slow cooker meals are a blessing. Thanks! I really need to take out my slow cooker more often. I don’t think I could resist the cheesy goodness of this mac and cheese. Love the addition of the jalapenos! You had me at bacon, and mac and cheese! Wow, I love that you made this in a slow cooker, Christin! Especially since you don’t have to cook the pasta first! Sounds amazing with the jalapeno and bacon! 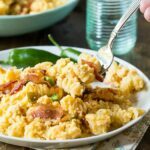 Slow cooker mac and cheese? say whaaaat??? Thanks so much for sharing your version of Trisha’s recipe – I love the jalapenos added in and I know my daughter will love the bacon part! You had me at bacon mac ‘n cheese! What a fabulous idea to make this in the slow cooker. My husband will go nuts over this! Pinned! I love making all kinds of mac n’ cheese and this one looks delicious! I love the addition of the jalapenos for a little spice and kick! I have seen Mac Cheese recipes so many times but somehow never tried it in my kitchen even once despite knowing that my daughter is going to love it.